On many forms of cash value life insurance the premiums can "vanish" or be discontinued. The premium can vanish when the cash accumulation account (less any policy loans) exceeds the projected net single premium for all the future benefits. It is very important to understand that this calculation is generally based upon current assumptions including interest rates and dividends on par policies. If the interest rates, policy expenses or mortality experience changes, additional premiums may become due in order to maintain the policy. A type of annuity that allows the annuitant to select a number of different investment alternatives. 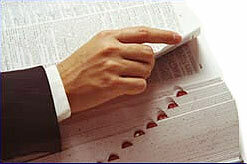 The annuity proceeds are separated from the investments of the insurance company and are placed in a separate account. The insurance company accepts the mortality risk for the annuitant and guarantees payments for life once the contract is annuitized. Unlike a fixed annuity, the annuitant accepts the investment risk not the insurance company. These products can only be sold by registered representatives . A form of cash value life insurance where the policy values are linked to a portfolio of securities. The portfolio is separated from the investments of the insurance company and held in a separate account. The portfolio is typically a group of funds established by the insurance company that the policy owner may select from. The policy owner may change the mix of funds that his or her account values are invested in. These products can only be sold by registered representatives. Renewal commissions that continue to be paid to an agent or their estate, whether or not the agent remains actively contracted with the insurance company. When an individual is held liable for the actions of another person. For example an employee damages the property of a customer. The customer may hold both (or either) financially responsible for the damages.